There was a man in the land of Uz, whose name was Job; and that man was perfect and upright, and one that feared God, and eschewed evil. 2And there were born unto him seven sons and three daughters. 3His substance also was seven thousand sheep, and three thousand camels, and five hundred yoke of oxen, and five hundred she asses, and a very great household; so that this man was the greatest of all the men of the east. 6Now there was a day when the sons of God came to present themselves before the LORD, and Satan came also among them. 7And the LORD said unto Satan, Whence comest thou? 9Then Satan answered the LORD, and said, Doth Job fear God for nought? 10Hast not thou made an hedge about him, and about his house, and about all that he hath on every side? thou hast blessed the work of his hands, and his substance is increased in the land. 11But put forth thine hand now, and touch all that he hath, and he will curse thee to thy face. 14And there came a messenger unto Job, and said, The oxen were plowing, and the asses feeding beside them: 15And the Sabeans fell upon them, and took them away; yea, they have slain the servants with the edge of the sword; and I only am escaped alone to tell thee. 18While he was yet speaking, there came also another, and said, Thy sons and thy daughters were eating and drinking wine in their eldest brother’s house: 19And, behold, there came a great wind from the wilderness, and smote the four corners of the house, and it fell upon the young men, and they are dead; and I only am escaped alone to tell thee. 20Then Job arose, and rent his mantle, and shaved his head, and fell down upon the ground, and worshipped, 21And said, Naked came I out of my mother’s womb, and naked shall I return thither: the LORD gave, and the LORD hath taken away; blessed be the name of the LORD. 22In all this Job sinned not, nor charged God foolishly..
whose name was Job] The Heb. form of the name is Iyyôb. Ezekiel alludes to Job along side of other renowned names such as Noah and Daniel: “Though these three men, Noah, Daniel and Job were in it (the sinful land), they should deliver but their own souls by their righteousness,” 14:14. The tradition regarding Job and his sufferings was probably well known in the East, and the name of the suffering hero was part of the tradition. If the name is derived from Hebrew, the word might mean the “assailed” or “persecuted.” In Arabic the form of the word is Ayyûb, and if derived from this dialect the name might mean the “returning,” that is, penitent, or more generally, the “pious.” Job is several times spoken of in the Kor’an. that man was perfect] The term “perfect” means properly “complete,” without defect. It does not imply that the man was sinless. Job never puts forward any such pretension, but he does claim that he was a righteous man and free from such sins that would bring down the punishment of heaven. That Job was perfect is the very foundation of his trial as well as first principle of the Book. Job’s “perfection” is even affirmed in heaven: “Hast thou considered my servant Job … a perfect and an upright man?” 1:8, 2: 3 ; it is understood by his wife: Dost thou still hold fast thy perfection? 2: 9; and it is persistently claimed for himself by Job, not only in moments of excitement when stung by the insinuations of his friends: I am perfect, 9:11, but also when the heat of the conflict is over and under the most solemn oaths: As God liveth who hath taken away my right, … I will not remove my perfection from me; my righteousness I hold fast, 27: 2, 5, 6. The word occurs in another form in 22:4: The just, perfect man is. laughed to scorn. Even the three friends admit Job’s perfectness in general, although they are under the impression that he must have been guilty of some serious offenses to account for his calamities, and they urge it upon Job as a ground of confidence in his ultimate recovery: Is not thy hope the perfectness of thy ways? 4: 6; and again: “God will not cast away a perfect man,” 8: 20. The term ” perfect” is used of Noah in the same sense: Noah, a just man, was perfect in his generation; that is, he was righteous and exempt from the sins of his contemporaries, Gen. 6:9.
feared God] Job was not only just and upright, he was also god-fearing. These two descriptors are never separated in the Old Testament. The fear of the Lord is the beginning of wisdom; and wisdom includes both just thinking and right conduct. All of us seemingly believe that if a man is righteous, his life will be blessed, but if a man is unrighteous, his life will be cursed. So, we read in Isa 3:10, 11, as well as in Psalm 1 and in Proverbs. According to such a principle, Job should see his goodness reflected by a prosperous and good life, as a blessing from God. Yet, in this book we learn there are severe and inexplicable trials that come upon the righteous. There is more to this world than this world. 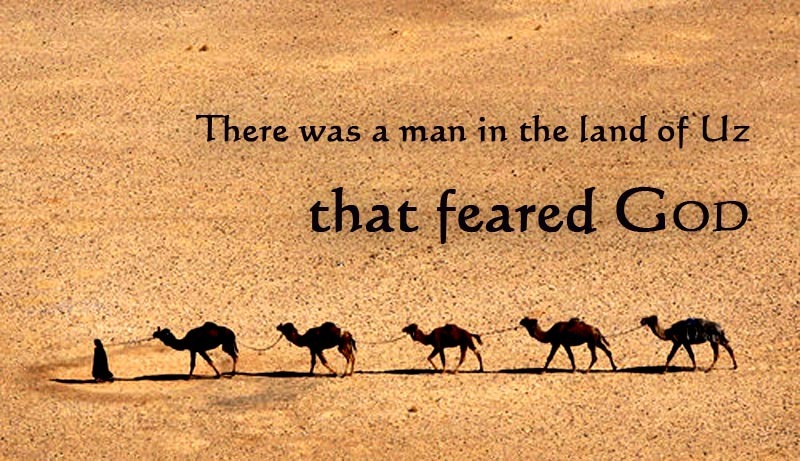 As a great Emeer, Job was rich in camels as well as other animals. Camels, of course, were used for riding when the journey was long, and for transporting produce and merchandise to distant cities. Camels were also eaten by the Arabs. In a country where wheeled carriages were unknown, asses were used not only for transportation, but for farming as well. Oxen, of course, were used for working the fields. In fact, the amount of arable land could be measured by the number of yoke, or pairs of oxen needed to cultivate that land. Job’s rich and extensive fields were plowed by a thousand oxen (5: 1). Such extensive possessions implied a very great household, or body of servants. Job is described as “the greatest of all the men (children) of the East.” His greatness did not lie in his wealth alone, but in the respect in which he was held and in his influence. in their house, every one his day] lit. made a feast at the house of each on his day, or, at the house of him whose day it was. 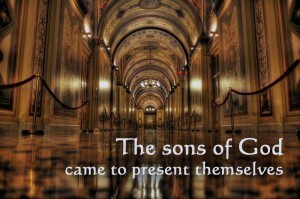 The seven sons each had their own home. Seemingly none of his children were married. Each son made a feast at his house on his day and invited the other six brothers and the three sisters. When the cycle of seven feasts had gone full circle, Job offered a sacrifice on their behalf. Since there were seven sons, there was a feast at the house of one of them in succession on each day of the week. At the end of the week, when all the seven had given their feast, the father sent, possibly on the morning of the first day of the week, and sanctified them. This is what happened week after week; their life was a continual feast. sent and sanctified them] The sanctification or purification probably consisted in washings and change of garments (Gen.35:2), all in preparation of the sacrifice to follow. Similarly, Samuel said to the family of Jesse, “Sanctify yourselves and come with me to the sacrifice” (1 Samuel 16:5). The act of worship, then, was the sacrifice. And as was customary in the Patriarchal age, (to which Job belonged), the father of the family was priest of the family, and the sacrifice offered was the burnt-offering. number of them all] Whether Job offered ten burnt-offerings, (one for each child), or only seven, (one for each feast day), is uncertain. sinned, and cursed God in their hearts] Rather, sinned by disowning or renouncing God in their hearts. Job himself was not present at the youthful festivities. Perhaps, he no longer cared for such things. Maybe he did not want to impose his aged outlook on the youthful joys of his children. His desire was to see his children happy. His fear was not an indiscreet moment or open excess but rather some momentary turning away of the heart from God. Perhaps, in the middle of social enjoyment, the children might feel little or no need of God. The word translated curse means to bless, to greet (I Sam.25: 14). Much like the Italian ciao, the word is used both for greeting and for farewell. Peace (salam) or blessing of God was pronounced both upon meeting someone as well as leaving (Gen. 47: 7, 10). In Job, the word seems to carry with it the notion of taking leave, of bidding farewell to, and hence to disown or renounce. The man who curses God does so by renouncing God, by ignoring his dependence on God. Such was Job’s fear for his children. Above the scene of happiness on the earth is another scene, a foreboding scene in heaven itself. The Council of the Most High convenes. Around the throne of the God, stand “ministers that do his pleasure” (Ps. 103:21). For a brief moment, a veil is drawn aside, allowing us a glimpse of spiritual forces implementing a plan of action, much like an army laying out a strategy in war. Like an audience in a theater, we watch a performance on stage but the actions and words are inscrutable. For a brief moment, we see what Job never sees, but the full scope of what unfolds remains beyond our ability to fathom. Satan appears before God and in some mysterious way even does the bidding of God. Satan is granted a request to try the faith of Job, but he cannot afflict him in his physical person. As an audience, we understand what is happening, and yet, at the same time, we do not understand. Now there was a day when] lit. 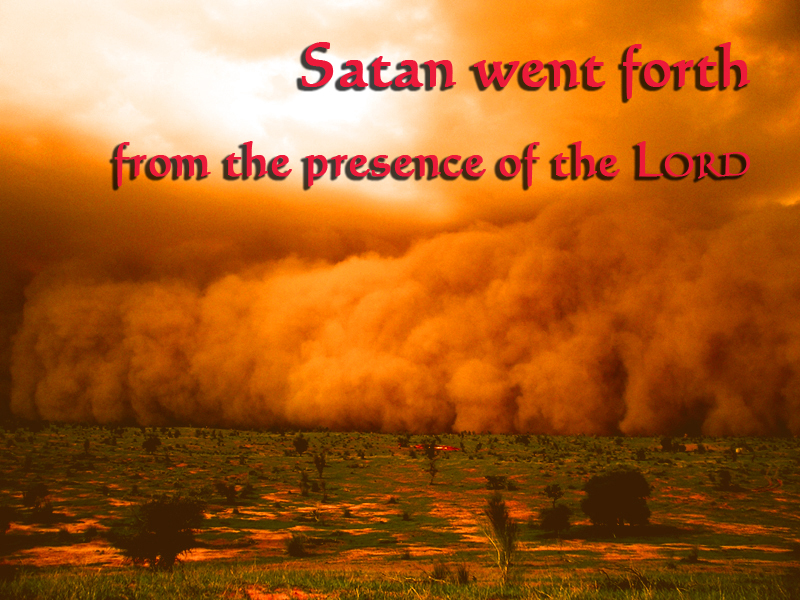 now it fell on a day that the sons of God presented themselves … and Satan came. The meaning seems to be not of some appointed time, but rather that Satan appeared among those who had convened before God. His appearance is seemingly stated as a paradox: Satan came as one of them, but not as one of them. The phrase is the same in 1:13; 2:1; 2 Kings 4:18.
the sons of God] Rather perhaps, sons of the Elohim, that is to say the angela. The Hebrew word, Elohim usually means God, with an emphasis on power and might of He who is God. The angels are not called” sons of God” as if they had actually derived their nature from Him as a child would from its father, or because of their continued devotion and holiness, they had been adopted by grace into the family of God. These ideas are not found here. The idea seems more to be that angels stand in contrast to men. Since Elohim implies such notions as power, might, and majesty, such traits would be common both of God and angels. God is the Elohim preeminently; He is the Almighty, but angels are Elohim only in an inferior sense. To be sure, they are above men, but equally sure, they are far below God Himself. Elohim, then, seemingly would describe the angelic nature or standing in contrast to what is human. The word angel means messenger and describes the duties which angels perform. In Psalm 89:6 angels are again referenced as Elohim or “sons of the mighty”; in Psalm 29:1: “ye mighty,” and there, as here, they stand in the temple or place of the Lord (Psa. 29:9; 89:6-8). For a scene in heaven similar to that presented here, see I Kings 22:19; Isaiah 4; Zechariah 3.
and Satan came also] lit. Adversary, or Opposer. An adversary is one who opposes another in his purpose. The angel of the Lord stood in the way of Balaam and his donkey as an adversary (Numb. 22: 22, 32). As a prosecutor, Satan stood on the right hand of the angel of the Lord to accuse the man brought before the court of God (Zech. 3:1). Similarly, we read, “The LORD raised up an adversary to Solomon, Hadad the Edomite” (I Kings 11:14). As men, we cannot understand how Satan, who opposes God, also serves God. 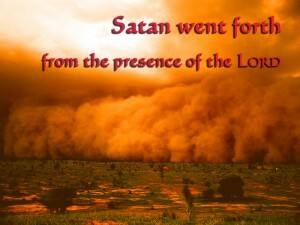 In some mysterious way, Satan represents God’s trying and sifting of men. Satan appears before God because Satan is one of God’s servants who must report and receive commissions as part of the will of God. The providence of God, though, is over all, even Satan. The will of God governs both heaven and earth, but the ways of God are beyond understanding, even for angels, who in some sense function as the agents of God. Perhaps, this is why the same action can be ascribed both to God and to Satan. In 2 Sam 24:1 we are told that the anger of the LORD incited David to number the people of God. However, the same act is described in 1 Chron 21:1 as having been instigated by Satan: “Satan stood up against Israel, and moved David to number Israel.” What we conclude is that in some sense, Satan does the bidding of God. We understand the purposes of God as usually beneficent and gracious with angels depicted as “ministering spirits, sent forth to minister for the sake of them who shall be heirs of salvation” (Heb 1:14). We think of angels as we do of goodness and purity. We sometimes say her voice was like an angel. But God also has purposes of judgment or chastisement. Those who execute judgment on the behest of God are called “destroyers” (Job 33:22; Exodus 12:23). Whether mercy or judgment, the angels seemingly function as servants. They do the behests of God. It may be that their own moral character does not always come into question. The spirit from the Lord that troubled Saul is called evil seemingly because of the effect produced on Saul’s mind (I Sam. 16:14). Likewise, the spirit that came forth to delude Ahab to his destruction functioned as a lying spirit in the mouth of Ahab’s prophets (I Kings 2:21-23). Whether or not the spirit himself was inherently evil, the impact certainly was, and yet in some inscrutable way, men are still held responsible for the evil they followed and for the lies they believe. In the book of Job, however, Satan seems to follow a different course altogether. Here, Satan demonstrates an invidious function, an assiduity toward evil. Indeed, unlike other court scenes in heaven, Satan initiates the marking out of Job for trial even though Job has done no wrong. It is almost as if Satan feels protected by his role and general commission. What we soon discover is that Satan by implication will accuse God. Job himself may be the test case, but to discredit God is the real object behind Satan’s accusation. From going to and fro] Since the words are used by Satan of himself, the words should not be understood as self-condemnation, but rather more along the lines of a boast: Satan speaks of himself as assiduously fulfilling a commission from God. In other passages, we read that ” the eyes of the Lord, that go to and fro” (2 Chron. 16:9), suggesting, perhaps, the swiftness and ubiquity of God over man. God sees all men, all of the time. Similar language is used to describe emissaries sent from heaven to aid the righteous in their suffering (Zech. 1:10, 11). Satan may be as assiduous as others who stand before God, but his purpose is quite different: “Your adversary, as a roaring lion, walketh about, seeking whom he may devour” (I Pet. 5:8). 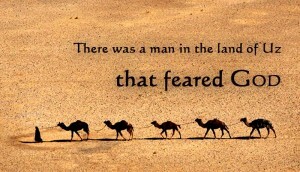 There is none like him] God himself passes judgment on Job. for nought] Satan does not dispute that Job is righteous. Instead, Satan seeks to accuse God. It is not difficult to understand why Job follows God. Job serves God because God serves Job. Of course, Job serves God; he is blessed of God. It is not God whom Job seeks, but the blessings from God. The slur is against man, to be sure, but the sarcasm is much more insidious and implies that no one truly serves God. Indeed, God is served only because of the benefits he confers. There is an irony here. Satan exhibits a personal malevolence against man, but Satan is still rigidly subordinated to heaven, and he must subserve the very interest of God whom he abhors. Satan willingly tests the sincerity of Job and when his work of trial is over, Satan is ignored. For all practical purposes, Satan is erased from the book. After the opening chapters, there is no more mention of him. So shall it be with us, when the trials of faith are over, Satan will be erased eternally. What is wrong will be made everlasting right. Having received his commission, Satan immediately “goes forth.” He relishes the opportunity of causing untold suffering, fully confident in the result that his claim against God will be upheld. Job does not know what has happened, or what will happen. Even when God restores Job to his health and blesses him a second time, Job is never told of the conversation that had happened in heaven. He lives out his life and eventually dies but never understands what had happened behind the scenes. So, it is with us. Our perception will change after death, but not before. Between verses 12 and 13 there is an interval, an ominous stillness much like the stillness before a storm strikes. The Narrator has drawn aside the curtain for us and we know what is impending. Job, however, knows nothing. Nor will he ever be told of the scene in heaven. His children are about him and he thinks the Almighty is yet with him. Later, he will reflect on his thoughts before the disaster fell: “When the Almighty was yet with me, when my children were about me” (29: 5). For now, though, the earth smiles to him as it always does day in and day out. By night the Bear, Orion and the Pleiades come forth in silent procession just as they have every night. Whether day or night, all is glorious with a constant glory because behind everything in night and day alike abides the unchanging hand that leads over all, the hand of the Holy God from whose words Job has never abandoned. Even in his unrelenting pain, Job held on to one consolation: “I have not concealed the words of the Holy One” (6:10). Even after the darkness comes and Job is left without explanation, he still believes that the candle of God shines upon him: “When his candle shined upon my head, and when by his light I walked through darkness” (29:3). That will be then, but for now, Job does not know that he is played like a pawn in a chess game. Suddenly the catastrophe overtakes him. Messenger after mes­senger, each taking up a tale of ruin before the other has concluded his,’ announce that all he had has been taken from him. Heaven and earth have combined to overwhelm Job. The forces of nature and the destructive violence of men have united to strip him bare. The description of the unfolding catastrophes seem to mock the idyllic life of Job. The catastrophes all fell on the day when Job’s children were feasting in their eldest brother’s house (5:13). This would have been the day on which Job would have sent for his children and would have sanctified them and would have offered sacrifices on their behalf. Job’s godliness, then, and his calamity are brought into the closest contrast. Undoubtedly, when the catastrophe struck, Job must have felt this. After all, Job regarded every event as wrought by the hand of God. So, it is no strange thing that such sudden and inexplicable afflictions must have thrown his mind into the deepest per­plexity regarding the ways of God. God’s ways may be beyond finding out, but the pain hit Job in his very soul. Even the way that the catastrophe unfolded must have added to his grief. Seemingly while heaven and men take turns striking Job, such strokes follow one another with increasing severity, and in each case, only one man escapes to bring more grievous tidings. However, there is nothing to suggest any struggle or rising rebelliousness in Job’s mind. His grief is real enough, but through it all, Job maintains his self-control. As the scene closes upon the sufferer, we find a solitary man, worshipping God amidst a waste where rich possessions once surrounded him on every side. Everything he once owned is gone. All of his children are dead. The loss of the oxen and she-asses, with the slaughter of the servants. Since the Bedawin do not usually shed blood unless opposed , Job’s servants probably were armed and offered resistance. Sabeans were an Arab tribe; different tribes were called by the same name (Gen. 10:7, 28; 25: 3). In Job 6:19, Sabeans are described as trading with caravans. They are men­tioned in connection with the Probably a detachments of the Sabeans encamped on the borders of Edom, and later attacked Job s servants. The raid came from the South, and the fact that the oxen were plowing indicates that the disaster occurred in winter. The fire of God was probably lightning (1Kings 18:38; 2 Kings 1:12). Neither the sultry, poisonous Samoom, (the hot desert wind) nor the rain of sulfur that destroyed Sodom seem likely explanations. What is important, however, is that the stroke came from heaven. Job could not have misunderstood the significance. Both heaven and earth are against Job. of Jordan and the Euphrates River. Dividing an attacking force into several bands, so as to fall on the enemy on several sides, was a common military tactic (Judges 7:16; 9:43; 1 Sam. 11:11). The death of Job’s children. The wind, apparently a whirlwind, struck the four corners of the house. The storm came out of the desert, most likely without warning. As becoming a man of high rank, Job remain seated as he received the messengers. However, when the initial shock had subsided, the full force of his misery struck home, causing him to stand up and give way to deep expression of grief inconsolable. He rent his mantle as a sign heart torn asunder by sorrow. The prophet Joel saw the torn mantle as a figure of a torn heart: “Rend your heart and not your garments” (2:13). Job shaved his head, removed every ring, every sign of wealth and of the prosperity in which he once live and threw himself on the ground, his forehead in the dust, in deepest submission before God who had laid him so low. Grief has its moments, and religion stands guard to see those moments, coming forth later to make such moments holy, and to grant peace to the heart. The “mantle” (me’eel) was probably not a separate garment as the word might suggest, but rather, a tunic, the uppermost of the garments proper. The tunic was worn by women and men of the highest rank (2 Sam. 13:18). The tunic was sometimes made of linen, or cotton and had flowing sleeves that reached down to the ankles. It was often richly embroidered, or made up of pieces of cloth of various colors (Gen 37:3). naked shall I return thither] The general sense is plain, though the precise idea is obscure. The words “my mother’s womb” must be literal, but the phrase “to return thither” seems suggestive of the moment at birth preceding our entrance into life and light. When we are born we leave the womb, going from darkness into light, and when we die, we leave the light of the world and return to darkness once more. In Psalms 139:15 the womb and inner earth are compared as the locus of life, as the sources from which life emerges: “Being curiously wrought in the lowest parts of the earth.” We have the expression, bosom of the earth. Whether animal, man, or plant, birth comes from darkness. “We brought nothing into the world, and it is certain we can carry nothing out” (1 Tim. 6:7). All that man has is a gift of God which He may recall. Job blesses God who both gave and recalled. the name of the Lord] Even though Job lived centuries before the Jewish nation was ever formed, he uses the highest name of God, Jehovah. 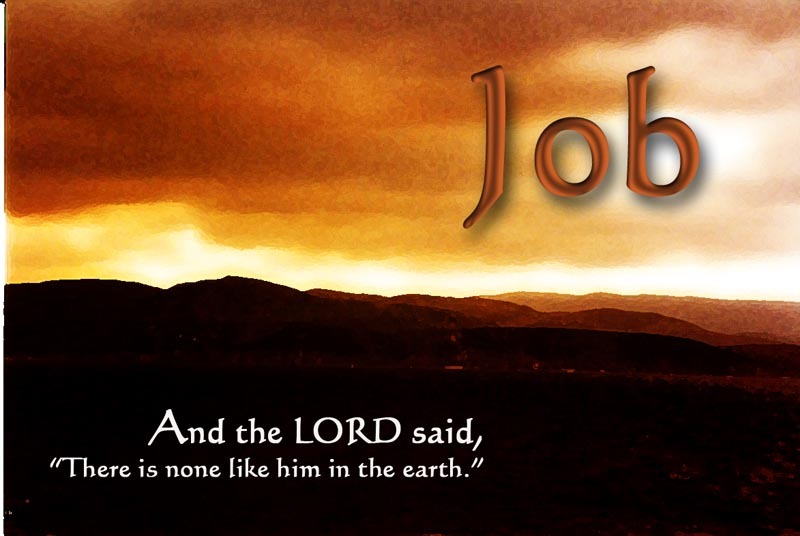 Job knew the name of God centuries before Moses asked God who it was that commissioned him. Job knew the Lord, and he knew him by name. In all this] Both in what he suffered and in what he said and did. Job’s expressions of grief were no sin. charged God foolishly] Rather attributed folly to God. Folly does not quite express the idea, but a better translation is difficult. The word itself literally means insipid, without flavor. Here the notion is probably something along the lines of moral impropriety. What Job seems to be saying is that God had not acted unsavorily toward him. God had not wronged Job in treating Job as he had. The confident expectation of Satan was proven false, and conclusively so. The irony is that Satan, not Job, was the one who had charged God foolishly.